Love baking? You should join the Duncan Hines Baker's Club! Every month they select their favourite creative recipe submitted by a Baker's Club member. 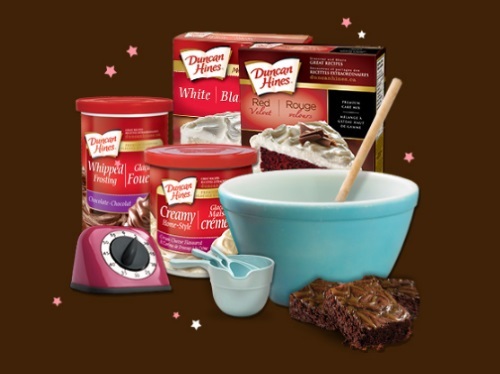 The selected baker will receive free Duncan Hines ​gifts and each month they choose a new member to reward. Show uthem what you whip up in the kitchen and they'll show you our gratitude. You must use at least one Duncan Hines product per recipe. You can add as many recipes as you like each month -- be sure to include a photo​ of your recipe​ and clear instructions. Favourite recipes are posted in ​the monthly Duncan Hines newsletter and on ​the Duncan Hines Canada Facebook page. Start baking!